While sweeping through the first town Bravo and Charlie Sections were engaged in a vicious 20 minute fire-fight, got surrounded and took multiple casualties, before being relieved and reinforced by Alpha and Delta. BLUFOR managed to push on and destroy an MBT in their primary objective zone, with the destruction of stockpiles of supplies and drugs. 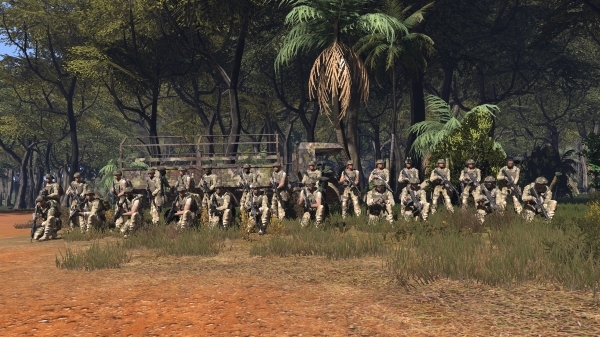 Although the anti-drug operation, Operation Low Horizon, was halted temporarily when booby traps in vehicles were detonated after the destruction of the supplies, BLUFOR have regrouped in a Troop Harbour ready to continue the Operation in due course. That was terrific. I think I killed the tank, and almost myself in the process. I have some great footage I'll put up soon.